A week ago PhD student Thomas Dekeyser tweeted a photograph of a note found in someone’s Zara jeans. We circulated it at work, and loads of people discussed what language it might be written in and what it could say. We’d found a note on a CD player and found help to translate it before. There’s a genre of shop-dropping in which factory workers leave notes for consumers in the things they make. Sometimes they’re genuine. Sometimes they’re hoaxes. Sometimes they’re part of activist campaigns. See our post The 13 best examples of shop-dropping … ever for more. This one was particularly relevant for the Fashion Revolution movement, whose core question is ‘Who made my clothes?’ This note could simply be a direct answer. According to Reddit. Or is there more to it? @Goblinmerchant @ThomasDekeyser I was intrigued so asked reddit hive mind to translate: "It's Bengali…probably a name…Fazlul Ashraf?" Thanks to Thomas and to Brad Garrett for the tipoff. Who made my stuff? Look for the letters! If you have just read Ian’s piece ‘What to do if you find a cry for help in your Christmas presents this year’ in The Conversation, a link will probably have brought you here. Where have you arrived? This is the behind the scenes ‘back office’ blog for the spoof shopping website followthethings.com. 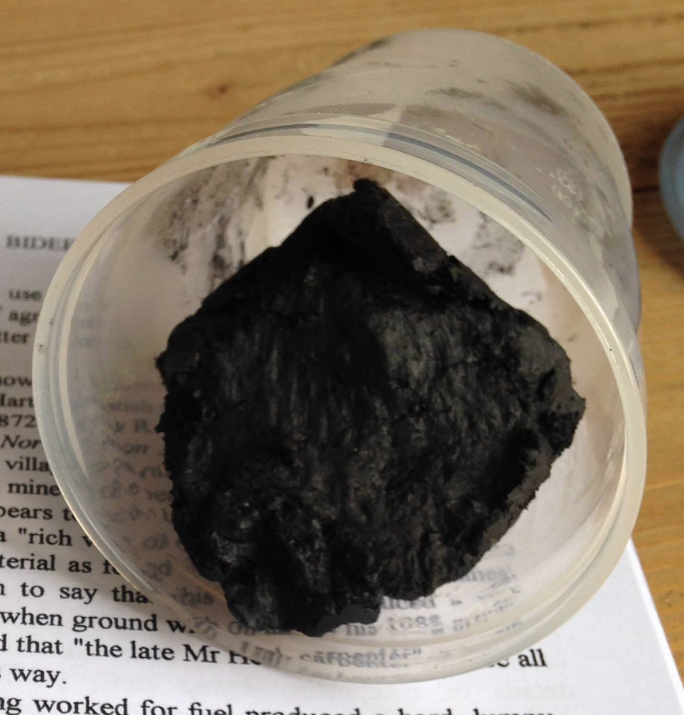 It’s a website that showcases Ian et al’s research into the making, reception and impacts of over sixty examples of commodity activism – from documentary films, to art works, to activist pranks – whose aim it is to encourage audiences to think critically about their relations with the people who make the things they buy, and about their powers to effect change. It also aims to encourage and inspire new ‘follow the thing’ research and activism, by anyone and everyone who wishes to do this. This post is updated every time we find a new example. It includes some examples that have been researched and showcased on the followthethings.com store, plus other that haven’t yet made it. Please let us know in the comments what we are missing. Thanks. Our website followthethings.com is designed to bring together and confuse two kinds of ‘shopping’: going shopping for things, and shopping things (i.e. betraying their origins). Taking new information into stores and leaving it on/in or attaching it to the goods concerned is shopping in both senses of the word. It’s one of the most direct ways of bringing trade justice issues into spaces and acts of consumption. Whether this is done by consumer activists or factory workers, by accident or by design, genuine or faked, it’s called ‘shop dropping’ (sometimes ‘droplifting). Here’s our list of 16 examples, in date order, with some extras at the end. Perhaps the most famous example of shop dropping was undertaken in 1993 when the Barbie Liberation Organisation bought a bunch of talking GI Joe and Barbie Dolls, switched their voice boxes and placed them back in store. This video explains everything. And this handy worksheet shows you how you can make the switch yourself. In the 2005 ‘follow the jeans’ documentary ‘China Blue’, ‘At the end … [factory worker Jasmine] leaves a letter addressed to one such person in the pocket of a pair of jeans. The film simulates the journey of this letter from the boxes in the port, to the ships that transport them, and finally to the up-scale store that stocks the jeans, implying the complicity of Western consumers in the exploitative dynamics of transnational capital’ (Source: Moll 2007 p.163-4). Read more about this film on our site here. Photos and films taken on production lines to make sure that cameras work are sometimes left on cameras and phones for buyers to find. 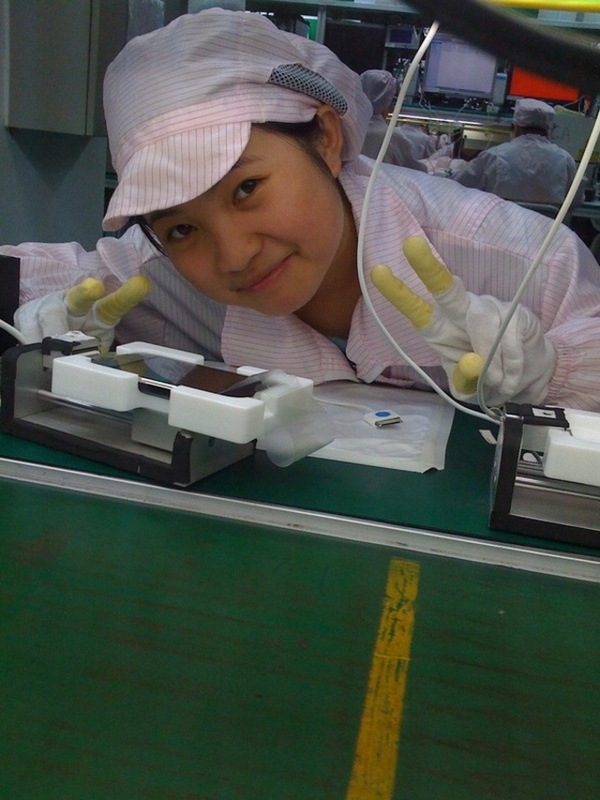 The most notorious are the photos taken of a young woman in a Foxconn factory in China who became known as ‘iPhone Girl’. Posted online by the person who bought the phone in 2008, they went viral online, generating arguments and suspicion worldwide. Read more about the ‘iPhone Girl’ phenomenon on our site here. In 2011, to publicise its ‘Killer Jeans’ report, anti-sweatshop group Labour Behind the Label encouraged activists to print out and add to jeans in store the label below. They wanted to ‘hid[e] messages in the pockets of thousands of pairs of designer jeans this week to highlight the serious health risks faced by workers making jeans for designer brands including Dolce and Gabanna and Armani’. Read the story here. Watch a video of this activism in store, here. 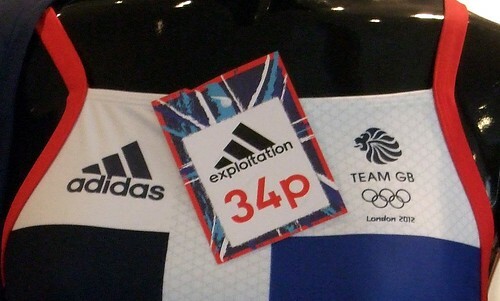 In 2012 War on Want encouraged activists to add 34p price labels to Adidas goods in store to highlight the poverty wages of factory workers making its goods in Indonesia. Read the story here. It was stored in the My Documents folder and clearly depicts the mundanity of life inside a hardware manufacturing plant. This was taken in the Quanta Chongqing Manufacturing City in Chongqing and the worker seems to be testing the camera on this particular model. Usually evidence of this testing is wiped out. It wasn’t in this case. Essentially, you’re looking at the face of modern manufacturing. He’s not mistreated, he’s not chained to his desk, but he’s building the same thing, over and over again, a prospect not many of us would relish. 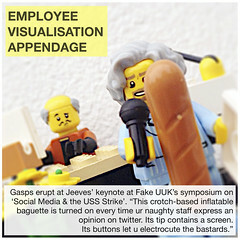 It’s a mundane view inside a fairly secret world that we as consumers rarely get to see. In September 2012, a shopper at Saks Fifth Avenue in New York City found a letter and a passport photo in the paper shopping bag in which the checkout person had places her new Hunter wellies. It was written by Tohnain Emmanuel Njong, a Cameroon national who was making the bags while incarcerated in a Chinese prison. In the letter, we wrote “Maybe this bag could go somewhere and they find this letter and they can let my family know or anybody [know] that I am in prison.” Read our site’s new page on this letter here. In December 2012 an American consumer posted onto facebook a photograph of a letter found in a box of K-Mart Halloween decorations. The letter seems to have been written by a person who helped to assemble them in a Labour camp in China. It begins ““If you occasionally buy this product, please kindly resend this letter to the World Human Right Organization.” Read our site’s new page on this letter here. In March 2013 – when this post was first written – Friends of the Earth in the UK marked the opening of an Apple Store in Leeds by adding ‘price tags’ to the goods on sale. In this case, they were pointing out the ‘price’ paid by rainforests in the production of tin that’s in Apple and other electronic goods. In June 2014, news stories started to appear in the UK about labels like this being found in Primark dresses. And other examples have started to appear in the news, for example. We researched this story so far (see our page here). In September 2015 ‘Sarah Corbett and other craftivists” set out “to lovingly handwrite messages onto beautiful paper and wrap them delicately in ribbon to place in clothes pockets in shops, fashion show seats and other secret places for people to find.” In making and placing these ‘secret scrolls’, they hoped, would “encourage people to think about who made our clothes, provoke questions and curiosity of the true cost of fashion, show the world that change is possible and celebrate all those creating a more sustainable future of the fashion industry.” In April 2016, they made this ‘how to?’ Mini Fashion Statements video for Fashion Revolution Day. It’s awesome. In November 2015, a Reddit user posted a photograph of a sketch and note found in an unopened box of Naturalizer shoes. The story, too, was sketchy. According to the Daily Mail, “A customer has found an SOS note in a shoe box claiming it is from a scared Ethiopian factory worker whose family were killed by soldiers. The sketched image of the worker with the accompanying note was uploaded to the website Reddit. It was translated by a user who claimed the worker said they were ‘hungry, sad’, afraid’ and pleaded for help. It also alleged that the worker’s family were killed by soldiers”. The post drew thousands of comments, some suspicious because it was posted on Reddit “the viral site that has a reputation as a source of some of the internet’s biggest hoaxes”. In December, an imgur user posted a photograph of a letter saying “Didnt know where else to put this, my dads just found this in a sock bought from Primark can anyone translate?” People responded, for example, saying “guy was framed for a crime he didnt commit and imprisoned, his wife ended up in mental hospital and his father was murdered”, “I’m Chinese and this letter is legitimately asking for help. You might want to report to police or news media”, “with enough attention it could probably hit the news” and “So if this is real, is there ever a good outcome to something like this?” Click the image below to follow the conversation. In May 2017, Christel Wallace bought a purse from a Walmart store in Arizona. Inside it she found tiny folded note in a zipper compartment. Her daughter-in-law posted it on facebook asking if anyone could translate its Chinese characters. Wallace knew about the other examples of prisoner notes being found in commodities including one where the author was found by journalists (see above). She hoped that making her note public might have the same results (see here for the original story). In October 2017, Zara shoppers in Istanbul found labels saying “I made this item you are going to buy, but I didn’t get paid for it” in the clothes. The notes were said to have been placed there by the people who had made them in Turkey because their factory – owned by the Bravo corporation – had closed overnight, leaving them with three months of unpaid back pay and no severance (see here for the original story). To date, no more details have come to light about this story. The story was published by national tabloid newspapers The Sun, Daily Mail and Mirror as well as local papers, including the Bolton Post. The Mirror had recently published an investigative piece called ‘Undercover at Amazon: exhausted humans are inefficient so robots are taking over‘ and all of the papers contacted Amazon and PMP for comment. PMP said they didn’t believe that the comment was accurate, but they would investigating the claim with its client Amazon (in the Mirror). Aprils’ mum Kim was worried and surprised: ‘I just hope no one gets in trouble or sacked for writing the note if it’s true. … You wouldn’t expect something like that to happen in the UK. You don’t like to think there is someone working in sweat shop. It’s shocking’ (in the Bolton Post). On December 21 2017, a short piece appeared in the UK’s Sun newspaper about a note found in a charity Christmas card bought in a pack from a Sainsbury’s supermarket by Jessica Rigby. She asked her friends to translate it, and they told her it was a greeting from a Prison product shop in Guangzhou, China. What exactly is shop-dropping and what’s it like to do?? We did this thing called ‘Shop Dropping’ where we used to decorate clothes and drop them in shops. So in Victoria’s Secret we’d leave huge granny pants with a sign saying, ‘please take me home, I’m yours’ – it was just fun! The shop people were so disarmed because you’re putting something in a shop; you’re not taking it away. We did one in Prada, and literally the whole of Broadway was looking. We took this huge dress, a really, really disgusting dress, and we got paints and did like big heart and words saying, ‘I’m really lonely’, or something like that. I can’t remember who placed it, it was either me or Kira, but we placed it on Broadway in that Rem Koolhaas building, and it was just so perfectly placed that the shop people couldn’t do anything. There were queues of people looking – it was there for two hours and it was amazing. Because it was really funny. I mean I couldn’t do that now, because I don’t want to do that. But at the time it felt right, it felt really right. We’d also often go into a designer shop and there’d be all these perfect shoes, and we’d get a pair of really old fucked-up Converse, with writing and stuff on the feet, and put it in and then walk out. So you’d leave it there and wait for it to be found, and then take a photo. We’d spend Saturdays doing that (Garnett in Stoppard nd link). Some shop-dropping is more deliberate than others, and a popular topic of debate is the truth/hoax value of the ones that seem to be accidental. What we love about them is that they spark our imaginations, and discussions, encourage us to ask what traces of human and other labour we could find on and in our things.